Meat Free Monday is a campaign which aims to encourage the nation to help slow climate change by reducing meat consumption. Launched by Paul, Stella and Mary McCartney in June 2009, the campaign aims to raise awareness of the environmental impact of meat eating and encourage people to meaningfully reduce their greenhouse gas emissions by having at least one meat-free day every week. Scientists agree that we need to reduce the amount of greenhouse gases (GHGs) in the atmosphere by 80% by 2050 to have a chance of avoiding catastrophic climate change. This is an enormous challenge, which no single action will achieve – government and individuals need to work together. It is often difficult however for individuals to identify ways in which they can have a real impact. Having a Meat Free Monday is a simple way for individuals to significantly reduce their emissions. • On a global scale the meat industry generates nearly 1/5 of the man made greenhouse gases that are accelerating climate change, more than the entire transport sector. Livestock accounts for 9% of global CO2 emissions, 37% of methane and 65% of nitrous oxide emissions. • Methane is 21 times more powerful than CO2 and nitrous oxide is 310 times more powerful than CO2. Methane remains in the atmosphere for 9 to 15 years; nitrous oxide for 114 years on average and is 296 times more potent than CO2 – the gases released today will continue to be active in degrading the climate decades from now. • In the EU livestock production is responsible for 15% of GHG emissions and in the UK it is responsible for about 8.5%. • The largest share of CO2 emissions from livestock derives from land use changes – especially deforestation. One hectare of Amazon rainforest is lost to cattle ranchers every 18 seconds. That’s about six football pitches of ancient forest destroyed every minute to create room for grazing cattle. • Meat and dairy products make up a third of humanity’s protein intake, and demand is growing fast. In 2000, global meat consumption was 230 million tonnes per year; by 2050 it is expected to reach 465 million tonnes. More livestock means more greenhouse gases. • Only 5 to 25 per cent of the nutrients (depending on the animal) are converted into edible meat. The rest is spent on the animal’s metabolism and on building inedible nerve and bone tissue. In fact it can take up to 10kg of grain to make 1kg of beef. • About 40 calories of fossil fuel energy go into every calorie of feedlot beef, compared to the approximately 2 calories of fossil fuel energy that goes into producing one calorie of plant-based protein. Dr. Rajendra Pachauri, Chair of the UN Intergovernmental Panel on Climate Change and Nobel Peace Prize winner, has said that people should have one meat-free day a week if they want to make a personal and effective sacrifice that would help tackle climate change. • The group Compassion in World Farming estimates that if the average UK household halved its consumption of meat, this would cut more emissions that it they cut their car use in half. • In March 2009, Oxfam issued a policy paper ‘Changing food consumption in the UK to benefit people and planet’ which also called for a reduction in meat and dairy consumption. Oxfam suggests that replacing red meat and dairy with vegetables for just one day a week can cut an individual’s annual emissions by the equivalent of a 1,160-mile car trip. • Eating less meat can help slow deforestation. One hectare of Amazon rainforest is lost to cattle ranchers every 18 seconds. In the largest meat-producing state in Brazil livestock production is responsible for vastly more deforestation than soya. • A third of all cereal crops, and well over 90% of soya, goes into animal feed not food for humans. As we begin to feel the effects of climate change on food production, eating less meat can help to ensure world food security and feed the world’s hungry. • Livestock production is the largest source of water pollutants: animal wastes, antibiotics, hormones, chemicals, fertilisers and pesticides for feed crops. • The estimated 634 gallons of fresh water required to produce one 5.2 ounce (147g) beef burger would be enough for a four-hour shower. • According to the World Health Organization we eat about twice as much protein as we need to stay healthy. Most of this is from meat and dairy. Diets too high in meat, particularly red meat, can lead to obesity and heart disease as well as a higher risk of some cancers. • In November 2007 the World Cancer Research Fund called for a diet low in red meat, avoidance of processed meats and eating a mainly plant-based diet. • A recent report in the medical journal The Lancet concluded that if we cut our meat consumption by 30% in the UK 18,000 fewer people would die prematurely from heart attacks each year – a reduction of 17%. • The Belgian town of Ghent was the first in the world to have an official meat-free day. Each Thursday the residents and school children are encouraged to eat vegetarian food. • Now a second Belgian city, Hasselt, has decided to launch a weekly vegetarian day too. • The Brazilian city of São Paulo (population 10 million) has gone meat-free on Mondays – a breakthrough in one of the world’s biggest meat-exporting countries. • In October in Baltimore public school district announced that it would be offering a special Meatless Monday menu to its 80,000 students. • The Swedish government has issued guidelines for climate-friendly food choices that recommend, amongst other things, reducing meat consumption. If all of the report’s guidelines were strictly adhered to Sweden could cut its emissions from food by 20-50%. Another initiative in Sweden is Max, the country’s largest homegrown chain of burger restaurants, putting emissions calculations on its menus – the chain reports that customers are making more low CO2 choices now that they can see the climate impact of their food. • There are now ‘meat free’, campaigns in the UK, US, Canada, Australia, Belgium, Brazil, Taiwan, Japan, Germany and Russia. The President hails Paul McCartney’s contribution to popular music and song during a ceremony to present the singer with the Library of Congress Gershwin Prize. Last night, longtime PETA booster Sir Paul McCartney rocked the White House. He sang “Michelle” to the first lady, and played to a packed crowd of celebs (including fellow PETA pal Emmylou Harris). To cap it all off, President Obama presented him with the Library of Congress Gershwin Prize for Popular Song. Eco-friendly fashion designer Stella McCartney, who was recently named creative director for the British Olympic Team, has designed a new t-shirt and tank top designed to raise awareness of the Meat Free Monday campaign. The tops feature a print by the late Linda McCartney called “Lucky in Daisies” and are made from organic cotton jersey. The items will be launched in Stella McCartney’s Bruton Street, London store as well as being available online. This special tee features a print by Linda McCartney “Lucky in Daisies” and was designed in support of Meat Free Monday, an organization encouraging the nation to help slow climate change by reducing meat consumption. 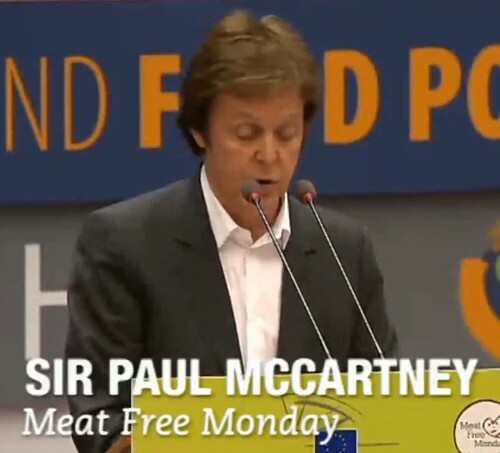 Launched in June 2009 by Paul, Stella and Mary McCartney, Meat Free Monday aims to raise awareness of the environmental impact of meat eating and encourage people to meaningfully reduce their greenhouse gas (GHG) emissions by having at least one meat-free day every week. A portion of sales of the Horse in Daisy tank and tshirt will support Meat Free Monday. http://www.supportmfm.org. Narrated by and starring Sir Paul McCartney, PETA’s shocking new video takes its inspiration from the most well-known quote in the animal rights movement and offers a brief glimpse behind the walls of slaughterhouses, factory farms, live-animal transport and the fishing industry. By teaming up with PETA to produce the powerful video — titled, “Glass Walls” — Sir Paul is helping to uncover the horrific abuse that the meat and dairy industries inflicts on animals to provide consumers with cheap burgers, nuggets and other products. He also explains the massive cost to the environment for which the meat industry is directly responsible. Billions of individual animals are violently killed for their flesh every year — whilst others spend almost their entire lives confined to filthy, cramped conditions, where they are forced to produce seemingly endless supplies of eggs or gallons of milk.